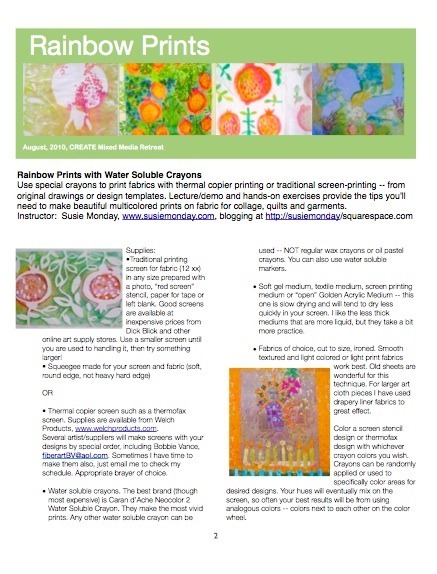 Nurture your creativity as you come away from a weekend with renewed energy, new materials and techniques in surface design applicable to fiber, ceramics, jewelry, painting and mixed media work. Susie Monday leads artists’ retreats and workshops throughout the year at her studio near Pipe Creek, Texas, about an hour from downtown San Antonio. El Cielo Studio workshops are designed with the needs of the participants in mind; free time is scheduled throughout the weekend for reading, reflection and personal work in the studio. You are welcome to bring projects in process for Susie’s critique and for peer feedback in an environment of trust and respect. You’ll share meals, poetry and stories, music and advice for living an artist’s life. Enjoy the 25-mile vistas from the deck, hot tub and pool time, and strolls down the country roads. The fee for each workshop retreat is $175 for a 2-day event with discounts for early enrollment. Comfortable accommodations are available from $15 - $30 per workshop. Most workshops offer a Friday night potluck option. Limited enrollment. Most supplies included. Susie has taught creative process and art techniques to adults and children for more than 30 years. Her art is in private and public collections around the world. Have you ever wanted to incorporate a favorite word, poem or quote into an art quilt, garment, art doll or other textile project -- going beyond simply writing or embroidering the text? This all new surface design/mixed media class will give you a set of process tools for making text and words an integral part of artfully designed fabrics that you can use in a wide variety of projects. Learn soy wax lettering, freeform cut letters, sunprinting and more. Embrace your inner goddess of summertime. Design and make a small art quilt “altar” for kitchen or dining room with tools and materials that depend on heat, sunlight and passionate delight: sun-printing, vegetable prints, fusing, hand and machine stitching and “found” fabrics from attic, thrift store or kitchen closet. We will recycle napkins, tea towels and other like objects and design a thermofax featuring a meaningful symbol, favorite fruit, icon, saint, culinary relative, heroine, angel or other meaningful design as the centerpiece for the altar. (Altar frame, $12 supply fee). Let late summer colors, shapes and even heat inspire your surface design. The weather is perfect for dyeing, dye-painting and soy wax! Sketching from nature, and from collected natural objects (don’t worry, you can do it), we’ll design one-of-a-kind fabrics, silk scarves and mixed media pieces. Explore the inner team that keeps you going, makes a difference, inspires your best --- and sometimes holds you back. With journaling, fabric printing, collage and mixed media techniques galore, you'll explore the inside-operators that are part of your life story: empress, playful child, journeyer, pilgrim, maker... who knows who will come out to visit? Create a unique fiber art quilt altar to one of the archetypes. Learning fusing techniques and how to make a small art quilt "altar" stretched on a frame. Suitable for all levels. Cost is $185, including $10 supply fee for altar frame. One private bedroom is still available, with two beds and private bath -- shared it's $15 each, single occupancy, $30. (Includes both nights.) Also a free sofa or sleeping porch bed is available. Most supplies are included. We'll start on Friday night with optional journaling exercises, then begin at 9 am on Saturday. The workshop usually ends about 3 on Sunday. Email me with the contact form on the sidebar if you are interested. Below are two photos from previous workshop, the first is Julia's altar in progress, the second, Martha's. I've received my contract for teaching at the International Quilt Festival in Houston in October, 2012. It's an honor to be among the 100 quilt/art/mixed media instructors selected to teach this year -- I've been off the roster for two years, and just squeeked in with my application this year! "Master design skills with free-form patterns, cut-paper shapes, and original stamps as you explore personal imagery and iconic symbols. Simplify photos for original quilts, printing and more. Thermofax screen mailed later." I'll tell you more about this as the time approaches, but the picture above provides a bit of info, too. Sunday, November 4, Inspiration is in the Cards, half day workshop 9-noon. "What inspires you? Create a one-of-a-kind card deck to spark creativity, take you out of your creative rut, move you into art-making and imagination. Collage and design your way to a new studio ritual with a variety of mixed media techniques." This one is part of my annual agenda in the January Artist's Journey workshop (usually), but its a fun way to make a mixed media deck using collage, paint, paper and an inkjet copier. In between, I'm on the circuit of the Mixed Media Miscellany, 2-4 on Thursday, the Friday Sampler, 10-noon and Saturday Sampler, 10-noon, with stamping and inkjet transfer demos. Hope to see you there! And if you know someone who is planning on attending and taking classes this year, please reccommend these if you think they would suit. I'm looking forward to the wild, wacky, inspiring, overwhelming experience of festival, and I think everyone in our community of textile artists deserves the experience at least once in a lifetime. It's our tribe.